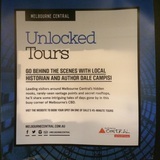 Melbourne Central's Unlocked Tours are run by the talented Dale Campisi who is not only an architecture, history and travel writer but also a local historian as well as an author. Making this triple threat the perfect person to run Melbourne Central's Unlocked Tours. As the name suggests the 45 minute tours, seeks to unlock the city's secrets to visitors and alike. On an unlocked tour, visitors can not only learn about the fascinating history of Melbourne Central but also about the Melbourne artists who have all contributed to the space as it is known today. The tour is not only an excellent opportunity to learn, but to also see with the tour showcasing Melbourne Central's hidden nooks, rarely-seen vantage points and secret rooftops. With places limited to 12 spots, it is best to book here early to ensure a spot on this tour. Please note booking requires a $10 fee to ensure the reservation is held.